The best way to report a problem is by emailing us the exact steps you are doing, that way we can reproduce the issue and better assist you in solving it. If you are a Windows 7 or later user, there's a tool built-in to Windows you can use to record the steps and send it to us! Start by clicking the Start button and type either “Steps” or “PSR” into built-in search box that appears. Then click the Problem Steps Recorder application in the search results displayed. Click Start Record and try to reproduce your bug or issue found in our software. You can even click Add Comment button to highlight an area of the screen as a call-out. 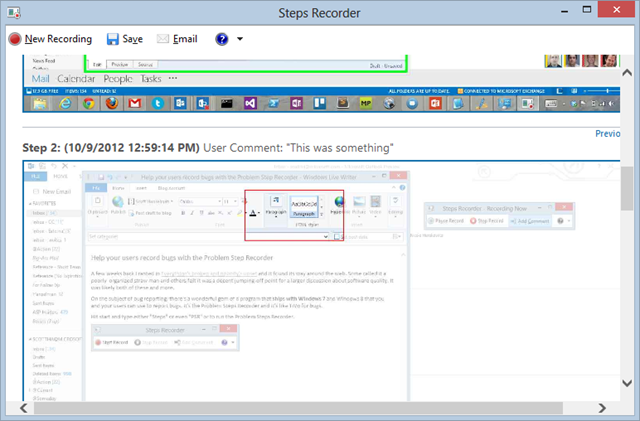 Now Steps Recorder is taking a screenshot of each click or action you take on the computer. Once each image is recorded you can then save all the images in a ZIP file by clicking the Stop Record button and Save option. Locate the ZIP file you just saved on your computer and right-click the ZIP file to select Send to > Mail recipient.